I guess I'm losing hope that you can hear me, but there's always that chance isn't there? That slim chance. It's all about slim chances now. 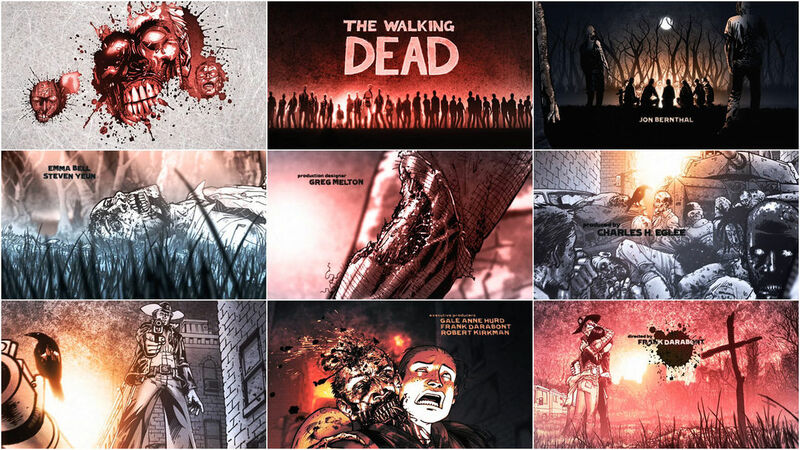 Bringing fresh energy to motion comics -animating panels as vibrantly dead as any Romero classic- Daniel Kanemoto's fan-made title sequence for AMC's new series The Walking Dead gives new form and perspective to the work of an impressive string of creatives. The original comic was given life by writer Robert Kirkman and artist Tony Moore, and Charlie Adlard from issue #7. 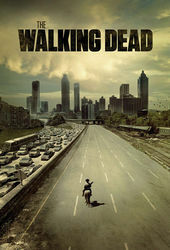 The Walking Dead debuts on All Hallows Eve with Frank Darabont as writer/director. 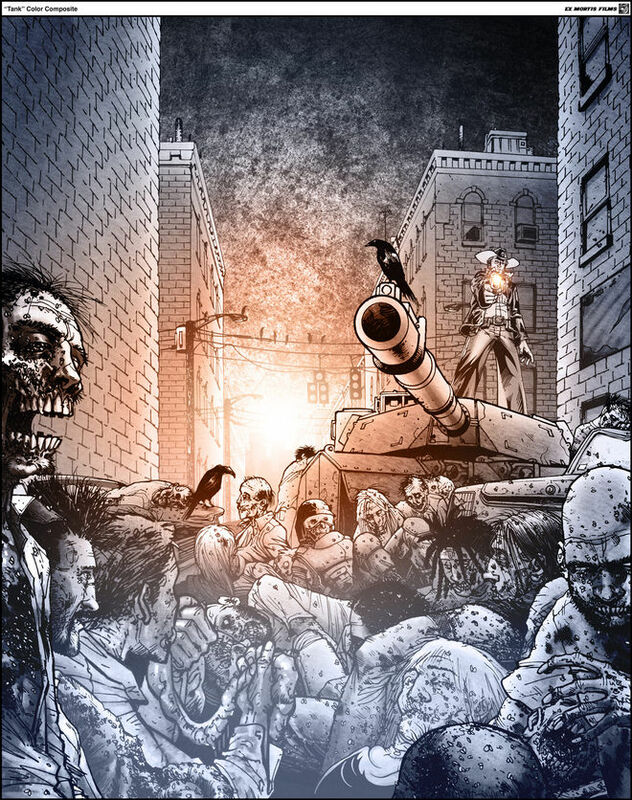 The infinite regress found in the hunt of our ghoulish selves found in source material this good should allow for deeper exploration into the allure of the walking dead. 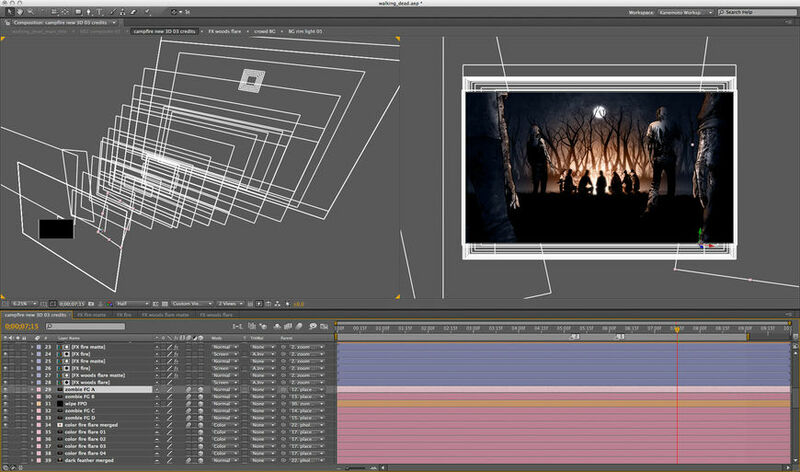 Animator DANIEL KANEMOTO details the creation of his sequence for us. 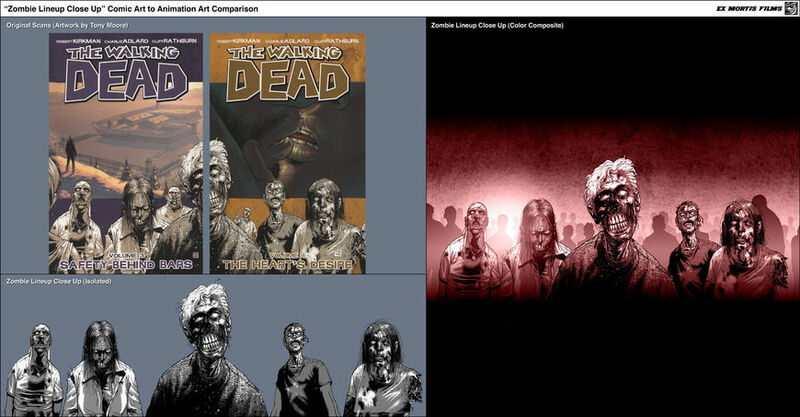 DK: I began this project after witnessing all the promotion surrounding Frank Darabont's adaptation of The Walking Dead at the San Diego Comic-Con. I've followed the show's development for years, ever since Frank optioned Robert Kirkman's groundbreaking comic book. And when I laid eyes on the teaser trailer, I was thrilled, both as a fan and a filmmaker… because what I saw onscreen looked exactly like what I imagined when I first read the comic. I poured all this enthusiasm into a spec title sequence because I recently relocated my animation studio, Ex Mortis Films to Los Angeles after spending the past decade in New York, and I wanted to create a showpiece to help announce my arrival on the West Coast. Since I love creating title sequences, I decided to make one for The Walking Dead to demonstrate my skills as a filmmaker. I set a deadline of 6 weeks to make the titles, working nights because my days were occupied revising scripts (I write just as much as I animate) and delivering some jobs for existing clients. My first task was to find a great piece of music, something I consider to be the heartbeat behind every great title sequence. I chose "Fresh Blood" by the Eels, and gave it to my longtime editor, Jeff Yorkes, who cut it down to under a minute. The song is a perfect thematic fit for Kirkman's story, which brilliantly illustrates why, in the aftermath of a zombie apocalypse, the undead aren't the only ones who seek "fresh blood"… so do the survivors. To quote one of my favorite lines from the comic, delivered by the main character, Rick Grimes: "We ARE the walking dead!" Once Jeff locked the music, I turned to the pages of the comic for inspiration. 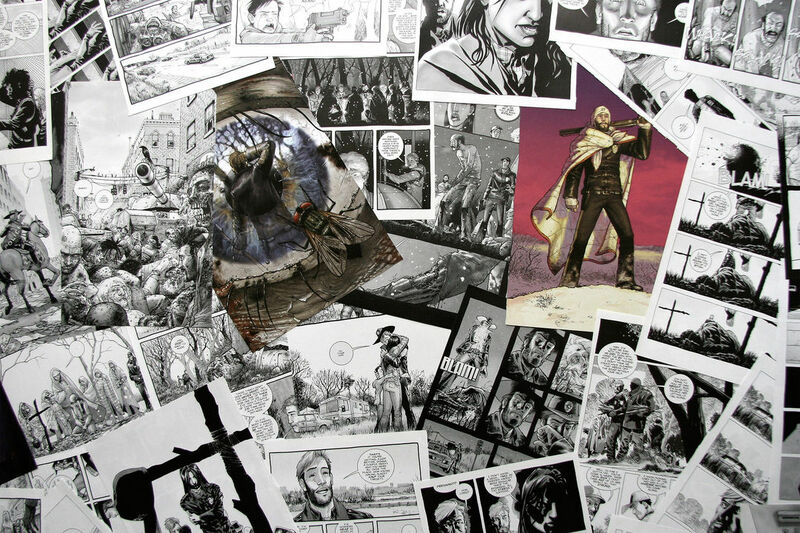 Without enough time or money to shoot anything original, the artwork of series artists Tony Moore and Charlie Adlard served as the basis for all my "footage." The primary technical challenge in executing this approach came in transforming artwork originally created for the comic book page into animation-ready elements. Although every scene began life in the comic, I had to reconstruct and often extend the artwork "past the page" in order to create enough layers to achieve the cinematic, "multi-plane on steroids" effect that defines this particular style of animation. 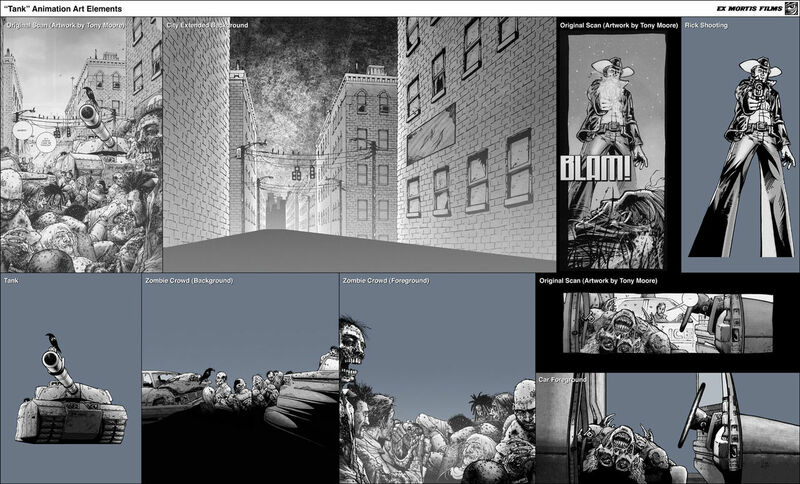 In some cases I created elements from scratch to blend everything together, while trying as hard as possible to maintain the graphic style pioneered by original artists Tony Moore and Charlie Adlard. Because I didn't have access to the original drawings, I worked from high resolution, 1200 DPI scans made from pages torn out of the comic books. It took a lot of work inside Photoshop to reduce the printing press artifacts that showed up in my 1080p high definition renders. Color was applied using gradients overlaid on top of the black and white illustrations, working from a color script that called for blood red to wash over the beginning and end of the sequence. Because I was working with static 2D artwork, I used various lightning effects to add depth to each scene. I created various mattes within After Effects to create a "Kodalith"-style glow to my light sources, which backlit most of my foreground elements. I also sandwiched layers of semi-transparent "mist" (usually just a white gradient) in-between every layer to help with the illusion of depth. In addition to animating my 3D camera, I also created isolated effects to punctuate each shot. Blood spatter opens the sequence (these individual droplets started life as brushes in Photoshop, but were scaled up and retouched by hand for HD resolution), leaves drift across the screen, and there's a fly cameo. 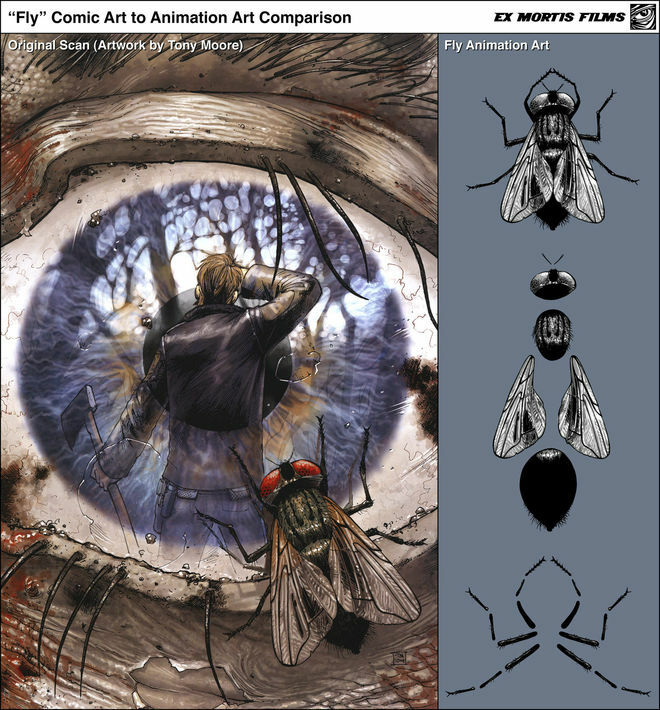 This buzzing insect was my homage to the clouds of flies that often surround the zombies in the comic, a horrible detail that always gives me the shivers. Beyond the technical challenges, the hardest part of making this sequence was not getting a chance to watch the entire pilot beforehand. I hope I was able to capture the spirit of the show, and I'm obviously thrilled that the sequence went "viral" and brought me so much attention, because I'm always on the lookout to pitch my talents. In the meantime, I know where I'll be on Halloween… camped out in front of the television with the lights turned off, ready to be thrilled and frightened by what Frank Darabont and his talented cast and crew have created!